Do you like the free magazine subscriptions I post about? Here's one I don't think I've run across before. 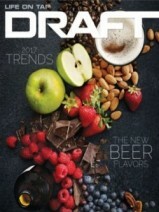 For the beer lovers out there, Draft magazine. DRAFT Magazine taps into the freshest flavors, unique experiences and emerging trends in beer, plus food, travel and leisure for a 360-degree view of the modern drinker’s lifestyle. You receive Top 25 Beers of the Year, Top 100 Beer Bars, Travel Guides, Beer Reviews, Recipes for cooking with beer and more...Stay up to date with your complimentary one year subscription! They say apply by 1/17 to get your free subscription. It really depends on how many people ask for it as these seem to be bound by a certain number of subscriptions, not time.